The Charming Tales were born about five years ago in a time before the world had gone fairytale crazy with Frozen and Maleficent (two movies that I adore) or even Tangled or Once Upon A Time. Inspired by lots of stories from childhood, along with The Princess Bride, Shrek and books like Piers Anthony’s Xanth series and Robert Lynn Asprin and Jody Lynn Nye’s Myth Adventures, The Charming Tales were meant to be a fun, comedic trip through fairytales. Like most comedy, there are some serious and dark issues lurking beneath the surface, but exploring the darkness is half the fun. The concept for the series began with the thought, “What if someone besides Prince Charming rescued the princess?” From there, it morphed through a dozen rewrites, as a few very assertive characters (I’m looking at you, Liz and Elle) took their rightful places in the tale and what began as a series of misadventures between the peasant, Will Pickett, and Prince Charming, became something far more. Despite this, it suffered even more rewrites and multiple rejections. 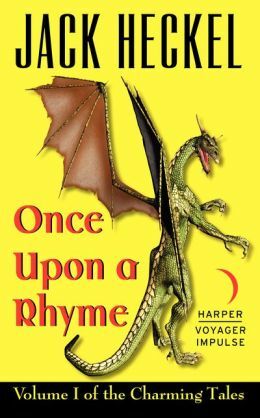 Today, Harper Voyager Impulse announced the publication of Once Upon a Rhyme. So, thank you to everyone. Books don’t write themselves, and authors don’t exist in a void. So very many people help from amazing editors to supportive families to those friends who won’t let you give up to the people that you’ve never met who read the book or are taking the time to read this blog. Thank you all. For those of you who are aspiring authors, never give up. It can happen.